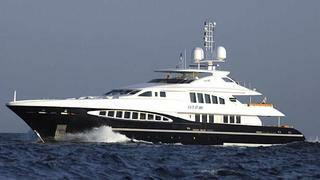 Burgess tell me that they've listed Heesen's 47.8m motor yacht Let it Be for sale. Built in 2007, Let it Be recently completed her Lloyd’s 5 year survey and is ready in all respects for a new owner. Accommodation for up to 12 guests in six spacious and light cabins featuring rose and mahogany woods complementing soft furnishings in beige, cream and blue. The master suite on the main deck comprises a private study, his and hers onyx bathrooms and leather and rosewood walk-in wardrobes. Further accommodation on the lower deck comprises three doubles and a twin cabin. All ensuite bathrooms are onyx and the twin cabin has a Jacuzzi bath. An additional double cabin can be found on the upper deck. The yacht boasts impressive deck areas for her size with the sundeck accommodating a large Jacuzzi, teppenyaki grill and shaded dining area. An additional sunbathing area lies forward of the bridge and provides stunning panoramas while underway. The main deck aft provides a more formal location for alfresco dining. Twin 1555hp MTU engines give her a range of 4,000 nautical mile at her cruising speed of 12 knots. Based in Valencia, Let it Be is asking €21.5 million.